Walking tours are a great way for people of all ages and skill levels to experience and take in all that Wilkes County has to offer. 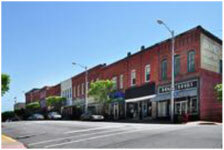 RV travelers, families with young children, and ecotourists that want to take in the expansive beauty of Wilkes County will all enjoy the wide variety of walking tours in the region. The Yadkin River Greenway was created through the cooperative efforts of citizen volunteers, landowners, and the governments of Wilkes County, North Wilkesboro, Wilkesboro, and the State of North Carolina. This Greenway is a natural area between urban communities where wildlife, vegetation, and streams are preserved and enjoyed. 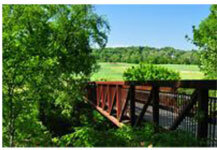 Greenways also provide transportation, recreation, and exercise opportunities for the community. 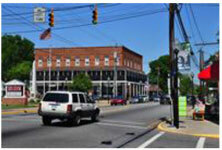 The YRG contains 1.7 miles of paved trail with three trailheads in North Wilkesboro and one in Wilkesboro. While walking down Main Street, it is easy to be transported back in time. As you look at the architecture, you can imagine the first dates at Liberty Theater, the horse driven carriages rolling down the street and all of the proud merchants, showing off their wares. It feels natural to become enchanted by the romance of the past yet inspired by the present. Take your time and exhale…you're in North Wilkesboro.